TGV Atlantique Paris-Tarbes, with connections to St. Lary bus station. Information available at any office station. Ter: Toulouse - Lannemezan: Connection Lannemezan / Saint-Lary and Tarbes / Saint-Lary bus station. Take A 10 highway Paris-Bordeaux-Agen and Auch RN21 to Lannemezan and then RD 929 to Saint-Lary. Take A 64 highway Bilbao, Bayonne, Pau, Tarbes, to Lannemezan (exit 16 - LANNEMEZAN) and then RD 929 to Saint Lary Soulan (direction Spain). Direct access to Spain and Aragon by tunnel. When entering St Lary Village pass the roundabout of Carrefour supermarket and at the next roundabout take the road on your right direction Saint-Lary/Pla d'Adet and follow the street straight to Soulan, road D123. 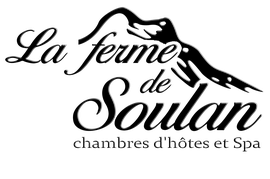 In Soulan, pass the village entrance sign and follow the sign "La Ferme de Soulan". Please park your car in the car park on the left side of the street. Please don't try to approach the house, you will not be able to enter by car in the courtyard!